They are not exactly dupes. 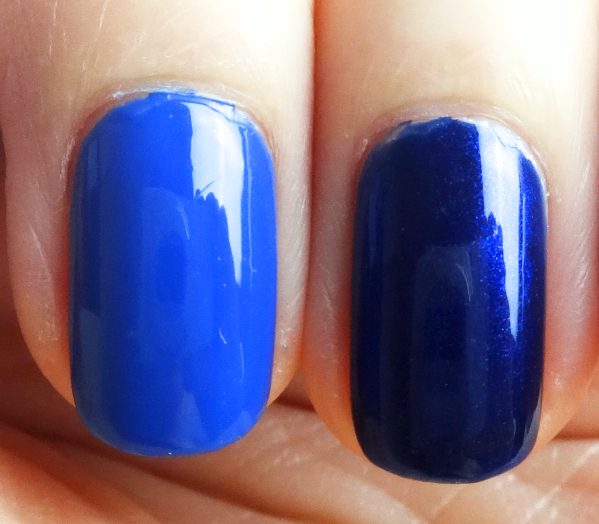 However, one vibrant medium blue creme and a deep navy with blue shimmer that are already in my collection doesn't really make me covet the new blue polishes from Chanel. Life needs other things than a pile of blue nail polishes. There still is no sign of the collection in the U.S. market. Chanel even sent out an email pitching their last spring collection a few days ago. At this point I have to wonder what is wrong with them. My enthusiasm for the collection is slowing dying, guys. I think Essie Mesmerize is at least a shade lighter than the Chanel Vibrato so that I secretly want it. Misa A Sin Worth Committing looks quite close to the Fortissimo, though. These polishes are incredibly staining especially when you remove them. Still worth the effort, I'd say, although no sin is worth committing. Hey Lena, I am not too sure what's going on with the Chanel collection, either. I haven't received any information about it. From what I can see, you are covered in the blue nail polish department tho! Hey Lena that's so strange! It's all here in Canada! I wonder what the heck is going on? I know!! And I don't think many Canadian folks gushing about the collection, either. LOL. True that life is worth other things, but I love a good blue nail polish. You know I used to always have staining issues with bright and dark blue nailpolishes, until I got Bleu Cobalt by YSL (a very dark blue), it does not stain at all! The staining issue is real though... just as with reds ;) I wore a blue manicure a few days ago and IT STAINED LIKE CRAZY!!! I know, the staining problem is real! I usually wear red to neutralize the stain(?) then move on to lighter colors. I don't even have a big cuticle issue, but it would be terrible on unevenly cut cuticles, you know? I like dark blues. I've been giving away my nail polishes though. I'm only keeping a handful. First, I don't wear them much, and second, I'm boring with nail. I only use colours with greyish hues, or muted colors or really dark colors - I have no idea why! I don't like pink or red on my nails, and truthfully, I'm just lazy. Hahaha! Dark blues are so chic! I used to wear dark dark navy when Chanel Black Satin was all the craze, then I stopped as soon as they brought out Blue Satin. That's how I am. 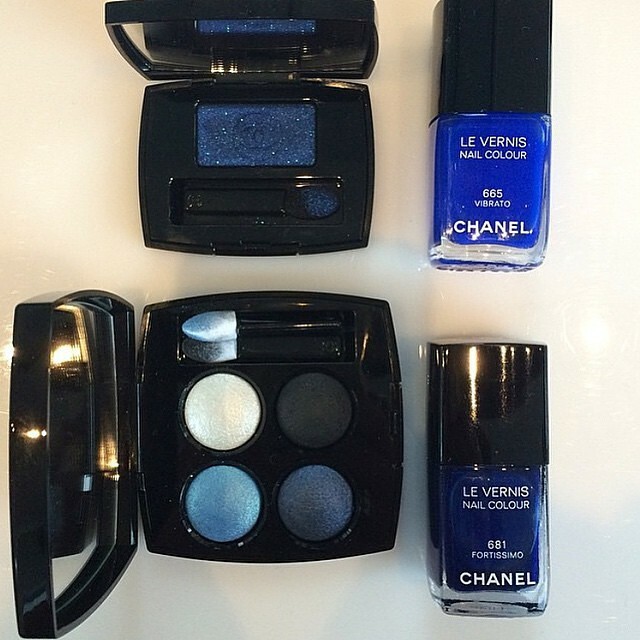 ;p I like that Chanel brought out vibrant blue shades that don't look gaudy or trashy. I just need to see them here!! Ooh, love both of these bad boys! I too am a big blue polish fan, though lavender has taken center stage this year. I thought no base coat could withstand the true staining test that is blue polish and for years just dealt with the aftermath. Nails Inc. NAIL KALE base coat. Life-changing. No staining. I've worn a vibrant turquoise blue cream and a navy pearl. No stains. ??? Where has this been all my life?! Always good when you can find things in your stash that satisfy your latest lemmings. Though Chanel polish is always hard to resist. The formula and bottle design are pure happiness. Oh, I will definitely try the Nail Kale base coat if I can find it! But KALE? As in kale..?? LOL LOL. I am still wearing the same mani but will do a new one today. The real challenge is when I remove the colors. 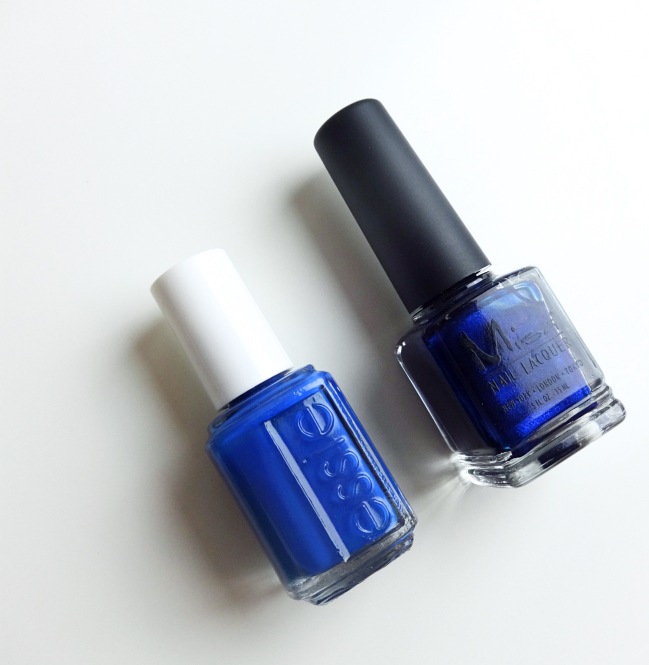 I have Dior Electric Blue, which is kind of like that Essie (maybe slightly more squishy), and I was just thinking about putting in on my toes...I think I will! (But, um, probably tomorrow. My plans for the rest of the night just include a shower and ice cream.) 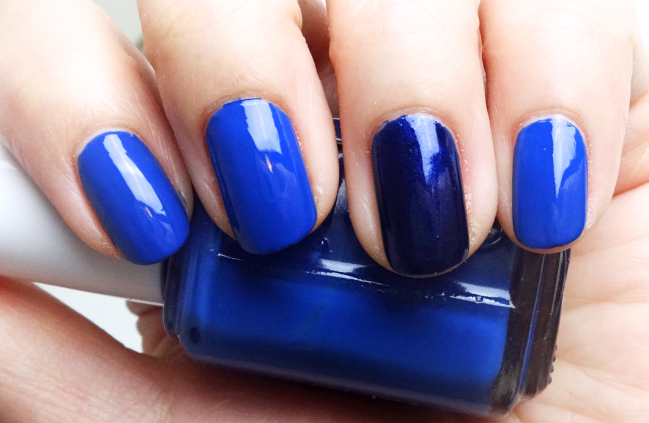 I love blues on nails - totally my favorite.